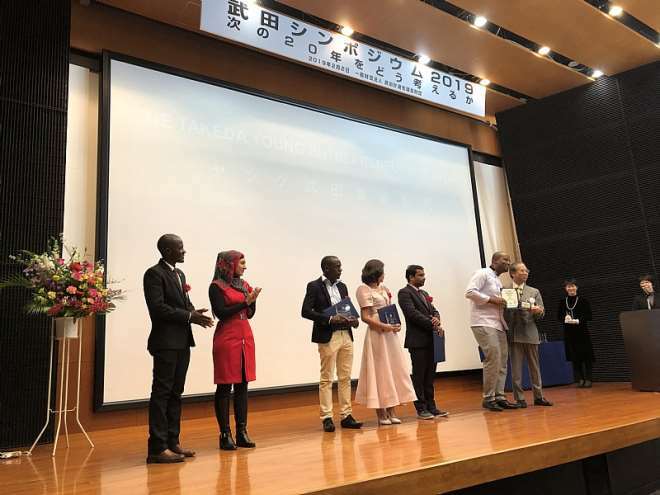 Ghanaian Chef and Social Entrepreneur, Chef Elijah Amoo Addo, was Saturday awarded the 2018 Takeda Foundation Young Entrepreneurship Award at the annual Takeda symposium in Tokyo, Japan. Chef Elijah was awarded the entrepreneurs’ category for his Okumkom mobile app and community food stores initiative, which brings affordable and convenient local food products to communities through a mobile app, website and community target stores. Chef Elijah co-founded Food for All Mobile Technologies Ltd as a company that leverages on mobile technology to create sustainable products and services within Ghana’s food and hospitality industry. He started Food for All Africa in 2014 to recover and provide free food to lower incomes residents, orphans, students and communities through food recovery and redistribution. In 2017, Chef Elijah started Okumkom mobile app as a platform to bring affordable local food products to target communities and with its first community store located in Teshie, Accra. The Takeda Young Entrepreneurship award recognizes the efforts of young entrepreneurial individuals who challenge technological or social needs across the world. The award places high values on innovative individuals who try to realize bold and clear-sighted ideas to solve issues based on technological and social needs. At a ceremony at the University of Tokyo, Japan, Prof. Kunihiro Asada, Professor Emeritus of the University of Tokyo and the Chairman of the selection committee encouraged the award winners to always strive for the wellbeing of humanity as the core of their businesses. The award winners were presented with plagues, diploma and cash prizes.